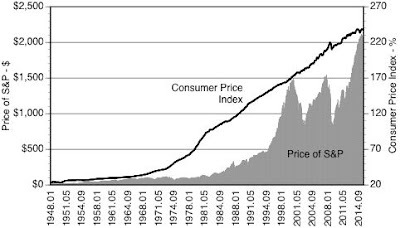 The market price of S&P Index is trying to keep up with the rise of the Consumer Price Index. As indicated in the following chart, a retired investor's portfolio will fall behind the cost of living if the retirement funds are kept by banks and financial services firms in index-based investment funds. For a retirement investor to succeed, the invested portfolio must be composed of funds and ETFs that are growing faster than the CPI. That requires careful screening of investment opportunities out of a collection of well over 9,000 investment offerings.